Helical Screw Blowers Market size was over USD 785 million in 2017, with projected gains close to 6% CAGR between 2018 and 2024. 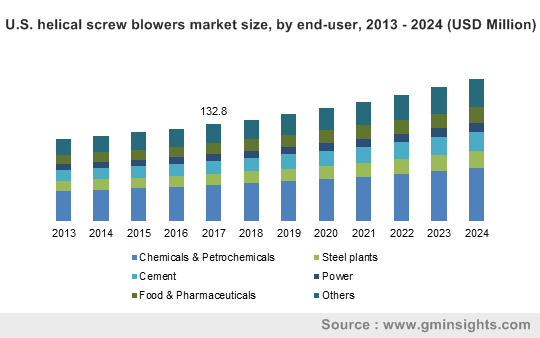 Growing need for highly efficient industrial products as demanded by the ongoing revolutionized industry 4.0 will propel the screw blowers market size in the near future. Manufacturers in various end-user industries such as food processing, power, iron & steel, etc. have been investing heavily to develop low noise and cost-effective products. This has led to the development of helical screw blowers that offer maximum flow, noise free operations and high efficiency. Screw blowers thus result in a reliable, continuous and energy-efficient air supply and exhibits better performance compared to the traditional roots blowers. Increasing emphasis on achieving greater efficiency and sustainability will encourage the demand for rotary screw blowers market by 2024.
International Standards Organization (ISO) has established a new class of air quality dedicated to the food & pharmaceuticals industries in the recent years. This standard has been recognized as Class 0, and was the most rigorous air quality class. The standard aimed to limit any oil contamination in food processing, aerosols, liquids, vapors, etc. On account of their oil-free design, the rotary screw blowers fulfill the Class 0 qualification. This Class 0 suitability will make them highly desirable in the industries with stringent requirements of pure and clean air, such as chemicals, petrochemicals, food, pharmaceuticals, etc. by 2024. Helical screw blowers not only lead to easy serviceability and cost efficiency, but also result in reduced energy consumption (up to 30%) as compared to the conventional roots blowers. With these features, screw blowers are expected to observe robust demand in ventilation & air-pollution-control systems and pneumatic conveying systems in the near future. High cost involved in the design of helical screw blowers might deter industry growth over the forecast timespan. However, the performance of the global helical screw blowers market will be linked closely to the global HVAC industry traits over the forecast timespan. Considering the design of the rotary screw blowers, both the types including belt drive and direct drive screw blowers held significant shares in 2017. Direct drive screw blowers are estimated to witness strong growth with CAGR close to 6.0% over the forecast timespan. Direct drive blowers have been witnessing a rising acceptance across various end-user industries on account of their enhanced efficiency, easy operationality and less maintenance. However, belt drive screw blowers will also observe significant demand for their lower cost as compared to their counterparts by 2024. Global rotary screw blowers market was led by chemicals & petrochemicals segment in 2017 with a massive share over 35%. These are used to convey, compress and boost the corrosive, inert and explosive gases such as: nitrogen, natural gas, flare & vent gas, chlorine gas and various hydrocarbon combinations generated in the chemical plants and refineries. Screw blowers are installed in some of the central processes in cement manufacturing plants. These blowers play significant role in pneumatic conveying of fly ash and cement, charging of kilns, aeration of silos, etc. Other areas of cement sector applications include: blending & aeration of the raw meal and cement, combustion air in kiln and burner. Cement was a crucial segment in the overall helical screw blowers industry in 2017 and is likely to witness substantial growth over 5% CAGR by 2024. Asia Pacific is expected to be the fastest growing region with CAGR over 6% in overall helical screw blowers market by 2024. With the debt bubble and the slower industrial production rate across the Chinese economy, shipments for industrial HVAC declined to some extent in 2016. 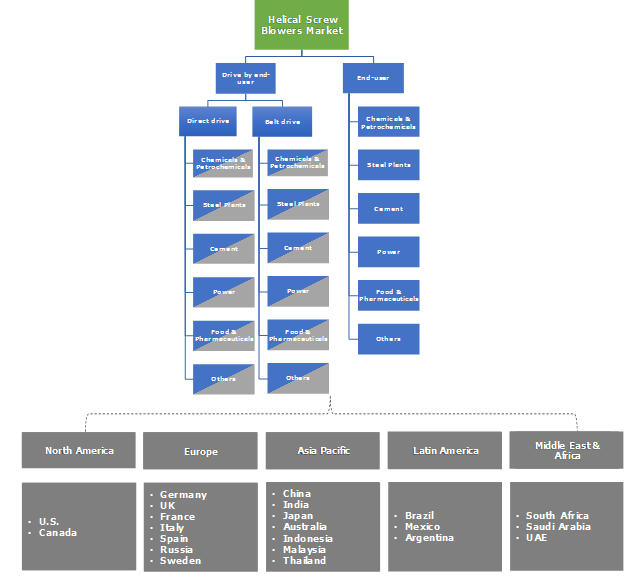 However, rapidly growing China and India have been allocating huge funds for the industrial development, which will boost the overall profile of the sectors including cement, steel, glass and metal processing in the future years. Several investments by the Government of India in the food processing industry will be another key factor propelling the regional market size. For instance, in 2016, the Indian government had announced its plans to set up 500 cold chain projects across the country. Nearly 42 mega food parks have been sanctioned for construction and are expected to be completed during the forecast period. Such trends depict brighter growth aspects for Asia Pacific helical screw market by 2024. Global rotary screw blowers industry has been highly concentrated with the key manufacturers including: Gardner Denver, Inc., Atlas Copco, KAESER KOMPRESSOREN etc. leading to about 70% market share in 2017. Few other prominent market players have been: Performance System III, Inc. (PSI), Universal Blower Pac and Swam Pneumatics Private Limited. The blowers industry has been witnessing a trend of ISO 8573-1 Class 0 certified positive displacement screw blowers for their exceptional efficiency. For instance, Class 0 certified screw blowers by Atlas Copco reduce energy costs up to 30% compared to conventional roots blowers. A helical screw blower is a positive displacement rotary machine, consisting a pair of intermeshing rotors, which are also known as: male and female rotors. These rotors move towards each other as the volume trapped between them and the housing decreases. The male and female rotors in screw blowers don’t make contact and are harmonized by the timing gears. Screw blowers serve as an enhancement over the traditional roots style blower and their profile resembling a helical screw assists an engine produce exceptional horsepower. Roots or lobe type blower efficiency is poor as compared to screw blowers as no internal compression takes place during the 360-degree rotation cycle, resulting in lower efficiency. Thus, rotary screw blowers hold substantial potential as a replacement to the roots blowers in the future years. Screw blowers will witness robust demand in the various end-user industries with a demand for a consistent flow of low-pressure air. The prominent sectors presenting a positive outlook for screw blowers over the forecast timespan include: cement, chemicals & petrochemicals, steel plants, power generation, food & pharmaceuticals and others.